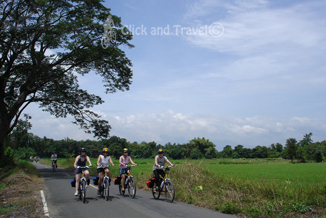 This relaxing cycling trip leads along carefully selected, quiet roads. The evening is spent in a small but lovely accommodation with great food. If you are interested in local, rural culture and your fitness level is average, this could be your perfect excursion. 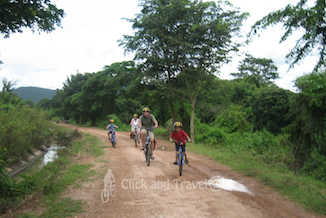 Moreover, this tour is also suitable for families with children. Day before the trip: Meeting around 6 pm at your hotel. Day 1:About 45 km flat (L, D). After a short safety briefing and bike fitting, we guide you through quiet lanes featuring Lanna architecture in some of Chiang Mai's interesting neighborhoods, hardly visited by tourists. 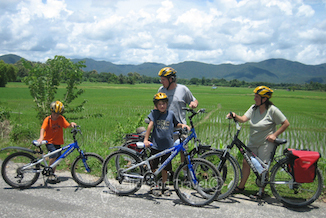 The cycling route continues on country roads through beautiful and varied sceneries with orchards, paddy fields and irrigation canals. In some some of the villages time seems to have come to a hold many years ago. You will experience the farmers' daily life and you will notice they still work in a traditional way. We will visit an impressive temple, located on a hill. The monastery is an important social center and school for the area. After visiting the local market, we continue to our accommodation for the night: a small boutique resort with swimming pool. Great food (Malaysian, Thai, Singaporean and Western) is being served by the very friendly hosts while you enjoy the lush, natural surroundings. Day 2: About 45 km flat (B, L). After a hearty breakfast your guide meets you for another cycling day. On today's trip you will pass by a Chinese cemetery and visit the nearby dam and reservoir. You continue on beautiful country roads through ever changing landscapes, enjoying the countryside in a way only a cyclist can. 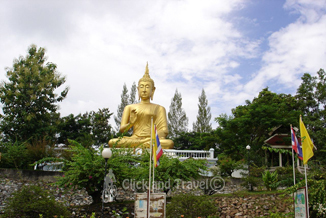 Several stops are made in order to get a better idea of the Thai way of life. While coming closer to the outskirts of Chiang Mai, we avoid the afternoon traffic by chosing small streets and alleyways. 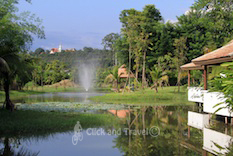 Back at your hotel you can relax after a rewarding Chiang Mai adventure. Duration: 2 days, 1 night, about 5 hours cycling each day. Distance: total cycling distance is about 90 km, mainly flat. 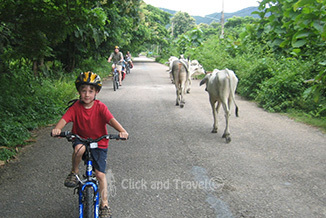 Category: Leisure cycling tour - average fitness level, families with children are welcome. 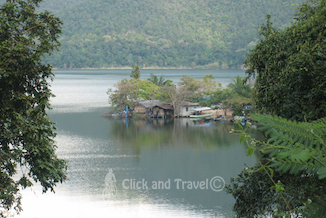 Key features: Thairural life and varied sceneries: dam, orchards, paddy fields, a very nice accommodation. Included: English speaking cycling guide, comfortable bike with front suspension, helmet (mandatory), insurance, snacks and bottled water, meals as specified in the itinerary, B-breakfast, L-lunch, D-dinner. Not included: drinks with dinner, personal expenses, tips. Accommodation: A small boutique resort with swimming pool in lush, natural surroundings. Great food, very friendly hosts. Thai massage is available. Bicycles: Adapted mountain bikes, also known as comfort bikes, with 24 gears and front suspension are used for their multifunctionality and comfort. 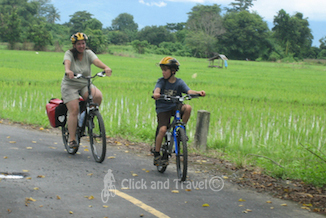 The bikes are equipped with water bottle carriers, rack and waterproof "Ortlieb" panniers. Frames for both men and women are available. Personal gear:People with particular requirements are advised to bring their own pedals, shoes, saddle, helmet, gloves or other cycling clothes. Meeting: Our guide will meet you at your hotel around 6 pm the day before the start of your trip and bring your cyclingbags. He will be happy to answer any remaining questions. Clothes: Suitable clothes are shorts and firm footwear. Please no loose fitting dresses that can get caught up in wheels, and no flip-flops. Your safety is a major concern to us. We provide a light poncho during the rainy season. Packing list: Sunglasses, sun block, insect repellent, pocket money and a small camera. 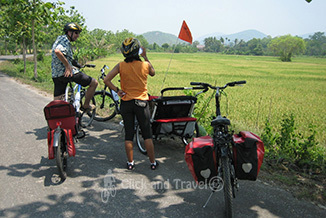 You will receive a complete packing list after your booking of this cycling tour is confirmed. Support: This environmentally friendly cycling tour does not need a support vehicle; however, back up is provided when necessary. GPS: The use of GPS or other tracking devices is not allowed during our tours. * To enjoy the child-discount, a child should share a room with 2 adults. Tour prices are based on 2 or 3 persons sharing a room. A single room supplement (950 Thai Baht) will be added if necessary. Departure is scheduled from Chiang Mai town. Check the tour map for the free pick up zone. Note: During the peak season period of 20/12 until 15/1, these prices are susceptible to change as a result of seasonal prices of the accommodation and/or compulsory Christmas and New Year dinners.